My Hills of Snow Hydrangea are blooming so prettily! Just had to paint this blossom as it has such a graceful and elegant look. I used only two colors, blue and yellow, to paint this and let the two mix freely on the wet paper to make the background. This worked beautifully for this piece, don't you think? 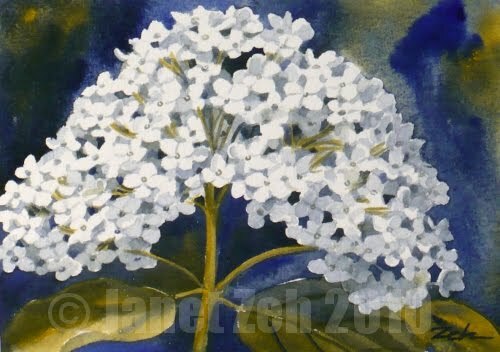 Find my small floral paintings for sale at JanetZeh.Etsy.com. Thanks for stopping by today! Thank you! It was one of those that painted itself so to speak.